A delivery crew of three men was aboard a 38-foot catamaran that capsized in February 2007 east of Bermuda in 45-foot seas. Two crewmen survived for 10 hours in the 63-degree water before they were rescued. The captain died. The difference between life and death in all likelihood was clothing. 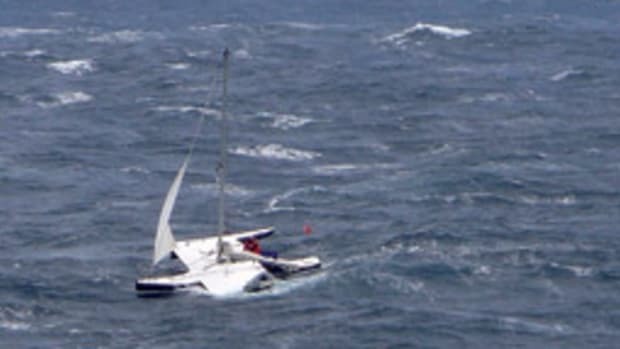 When the catamaran flipped, one crewman was on watch in the cockpit, dressed in full foul-weather gear with thermals and fleece underneath. The other crewman was huddled in his bunk, all of his foul-weather and thermal clothing on, as well as his harness and inflatable life vest. 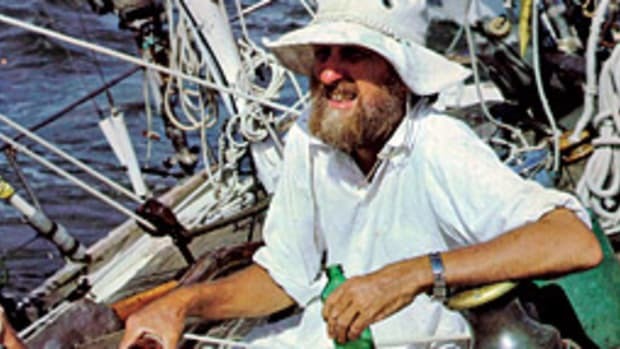 The captain, exhausted from long hours at the helm, was in his bunk, dressed only in thermals and a layer of fleece. That’s the way he escaped the overturned sailboat. But he couldn’t escape hypothermia. He was dead in about seven hours. 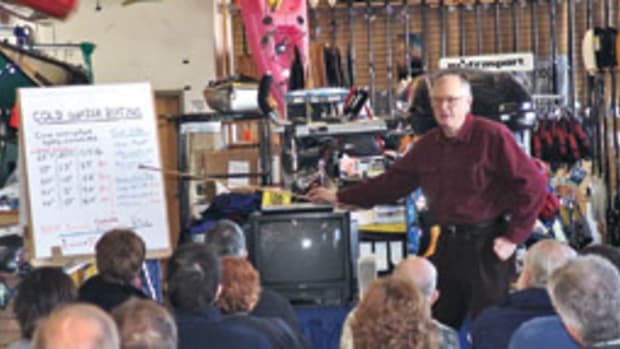 Whether you are wearing layers of clothing or an immersion suit, your chances of survival in cold water will be improved if the water surrounding you is not constantly being flushed away by new cold water, says Jim Hartt, vice president of Mustang Survival of Bellingham, Wash.
Of course, the best protection against cold water is to stay out of it. A prudent sailor limits the risk of falling overboard by wearing a harness and staying attached to the boat whenever possible. Even on board, however, the body can be exposed to cold. Boaters who venture offshore from Cape Hatteras, N.C., north are often traveling on 50-degree water, particularly New England waters. Waterproof foul-weather gear, a warm and dry head covering, and good boots with wool socks are essential. Few things can divert a boater’s attention from duties faster — and lead to danger faster — than cold feet or an unprotected head. But the risk of entering the water — either as a man overboard or if it is necessary to abandon ship — is always present. If you are aware of the hazards and are prepared for them, your chances of survival are vastly improved. The first hazard is “cold shock,” the reaction of your body to sudden immersion in cold water. Initially, you will gasp for air. If this happens when you are submerged or when you get doused by a large wave, you will inhale water, not air. You can anticipate and overcome the gasp reflex by holding your breath as you enter the water. Or you can enter gradually, as you would entering a chilly swimming pool, letting your tissues grow accustomed to the cold. Following the gasp reflex, there is a tendency to hyperventilate and an inability to hold your breath. At the same time, your pulse will accelerate. These symptoms last only a couple of minutes. In addition to gradual immersion, you can limit these cold shock effects by wearing layers of clothing, a wet or dry suit or a flotation jacket. Aboard my Westsail 32, Robin, we have two neoprene immersion suits. If the time ever comes when we have to part company with the boat, we will be in those “Gumby” suits, completely sealed from the cold water except for our faces. The price of carrying each suit on board at all times is the loss of storage space about equal to a rolled sleeping bag. 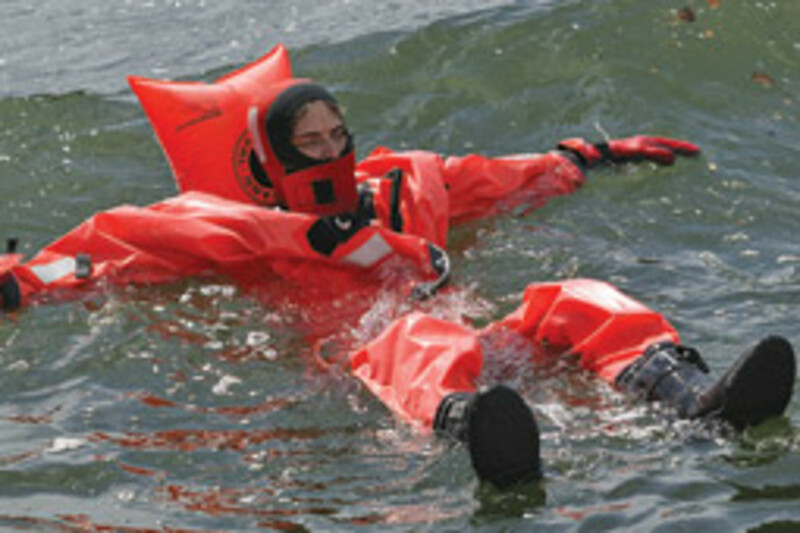 Immersion suits also provide flotation for your entire body. Make sure PFDs and immersion suits are readily available and that each crewmember knows where they are stowed. Without an immersion suit — assuming you survive the cold shock — your next hurdle is hypothermia, the loss of core body heat to the water surrounding you. The rate at which you lose heat depends on a number of factors, including your body fat (the more, the better) and your physical proportions (string beans get colder faster). The onset of hypothermia also is dictated by the water temperature. But “cold water” is a relative term. You can get hypothermia in 80-degree water if you are submerged long enough, because that water is colder than your body. Hypothermia progresses in identifiable stages. “The next stage [after cold shock] is typically between two or three minutes to the next half-hour in water,” Hartt says. “That’s when the human body starts to lose its function,” with cramping and a loss of dexterity, he says. 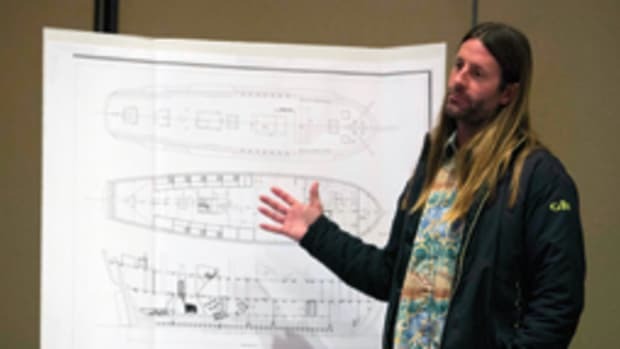 Survival expert Henry Marks, head of Landfall Navigation in Stamford, Conn., tells of conducting survival tests during which able-bodied scuba divers serving as rescue victims were left in 50-degree water for five minutes; they could not close their hands on the boarding ladder. If you find yourself in cold water and need to deploy survival gear, such as flares, do so quickly, while you still have the use of your hands. Dr. Michael E. Jacobs says strong swimmers have a 50/50 chance of reaching shore a half-mile away in 50-degree water. No one will survive a long swim, he says. It is better to stay where you are, tuck your knees up against your chest, wrap your arms around them to keep a layer of warmed water close to your body, and wait for help. Keeping the upper arms tucked against your sides helps insulate the chest near the lungs, a source of rapid cooling. And staying quiet helps, because the more you move, the more your blood is pumped toward the surface, where it will cool. If your boat is still floating, stay on board. 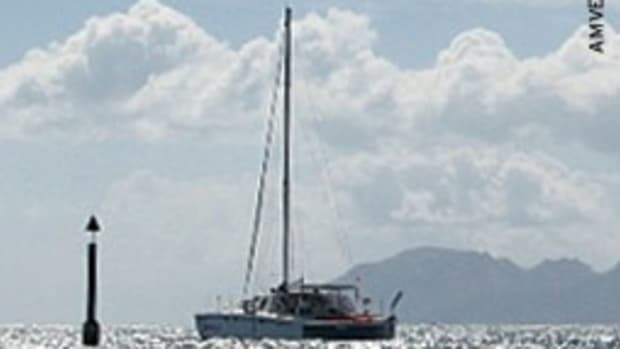 The crewmen of the capsized catamaran did the right thing by staying on their overturned boat, out of the water. Water, all experts agree, cools the body 25 times faster than air. So stay out of the water whenever possible. If you have to abandon ship for a life raft, try to get directly into the raft. In every case, the goal should be to keep the water away from the body. Hartt relates the story of five Newfoundland fishermen who in spring 2007 had to abandon their burning boat. “Four got to immersion suits and one couldn’t,” Hartt says. The four got into their suits and jumped into the cold North Atlantic. 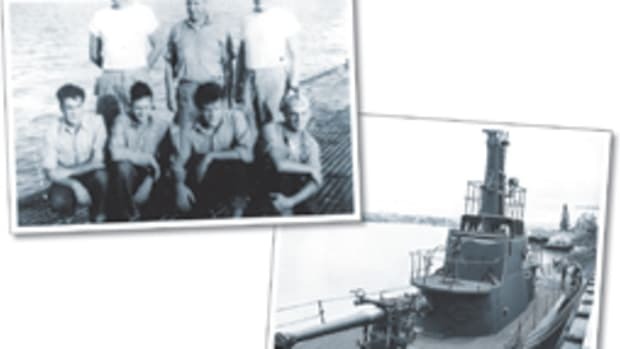 As their fishing boat burned to the waterline, the four formed a raft by joining hands — one man on each of four sides — and their shipmate, who was wearing only jeans and a T-shirt, lay on top of this human raft, up out of the water. 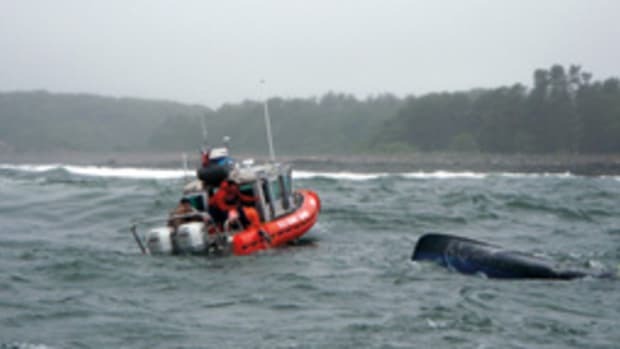 • If your boat is swamped or capsized but floating, stay with it. Get as much of your body out of the water as possible. Remember, cold water removes body heat 25 times faster than air. Stay as dry as possible. Roughly 50 percent of heat loss is through the head. • Do not try and swim to shore unless you are certain there is no chance of rescue and you are absolutely sure you can make it. • Swimming or treading water can increase heat loss by about 30 percent, so remain as still as possible. Assume the fetal position. Along with the obvious benefit of keeping you afloat, a PFD allows you to reduce movement. • Remain together and huddle in a circle for warmth, with children or elderly victims in the center. • Avoid sudden immersion in cold water, which can trigger “cold shock.” If necessary, enter the water as slowly as possible. • Remember the so-called “rules of 50”: A 50-year-old person has a 50-50 chance of surviving 50 minutes in 50-degree water. See related article: "Lessons from a tragedy."